This is one of the most common questions asked at Ocean First Institute community outreach events. While there is quite some distance from the mountains of Colorado to the ocean shorelines, it is easy to forget the interconnectedness of the world’s waterways. Our actions in Colorado affect marine life all across the globe. In fact, reports estimate that 80 percent of trash in the ocean originates from inland sources. Also, Colorado is uniquely positioned in that the Continental Divide crosses the state, causing rivers to flow toward the Pacific Ocean on the west side and the Atlantic Ocean on the east side. Actions taken in landlocked states, not only the coastlines, can have a tremendous impact on the health of our ocean and the marine life within it. So how do we protect the ocean here in Colorado? We work through three main approaches to bring about change and awareness: Research, Education, and Conservation. We believe the first step to protection is to understand what is happening and why. Through our research programs, we focus on fundamental questions about the marine world and the intimacies of how species interact with their environment. 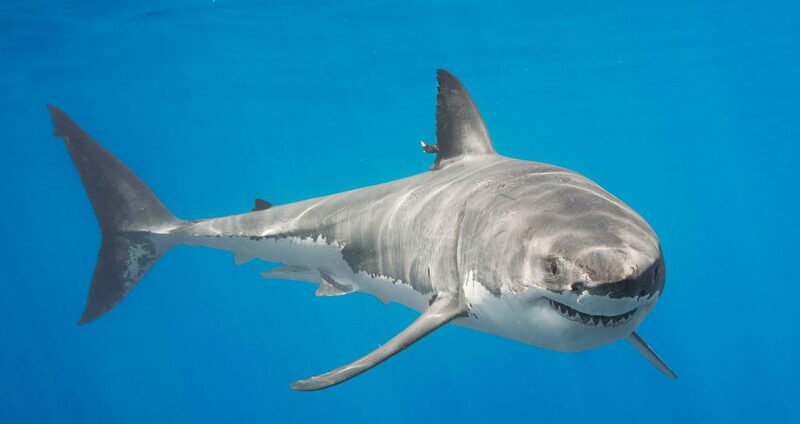 We predominantly study sharks and their close relatives, the skates and rays, many of which are endangered. We partner with universities and institutions to conduct field-based research and engage in conservation projects that focus on imperiled species and ecosystems. 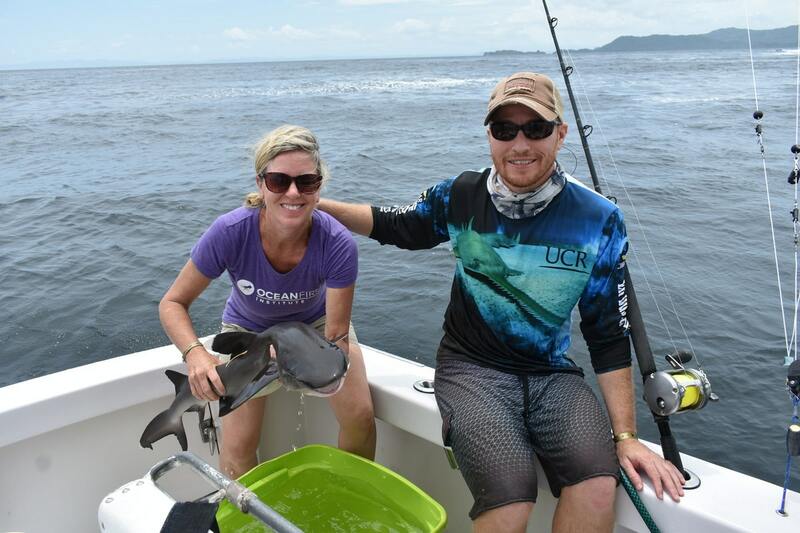 Dr. Mikki McComb-Kobza on a tagging trip in Costa Rica, along with our partners at Connect Ocean and the University of Costa Rica, supported by funding from the Sea of Change Foundation. Photo credit: Ocean First Institute. Our most recent research project involves protection of sensitive wildlife in Costa Rica. While little research has been done in the area, it maintains one of the highest rates of biodiversity. To understand how the area needs protection from fishing pressures, we are collecting baseline data to provide to fisheries managers and the community. In 2019, we hope to continue our research in Costa Rica by surveying endangered shark and ray species. By tagging and tracking these animals, we are learning about their movements and how we can best protect them. Through our school outreach programs, we bring the ocean to the classroom. Our programs educate local youth, as well as students around the world, about our connection to the ocean, no matter how far away, and expands their knowledge of marine biology and conservation. Through interactive activities and hands-on inquiry, we engage students in science, engineering, art, and mathematics. Our outreach programs teach students about how we are all connected to the ocean and influence future leaders in the field of marine science. 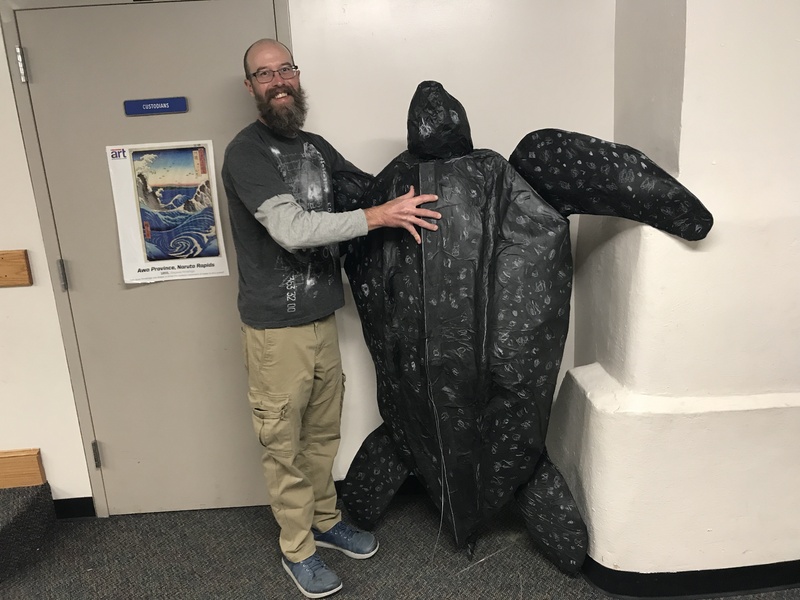 After several OFI visits this year to Central Elementary School in Longmont, students were inspired to create their own 5 ft. leatherback sea turtle made from reclaimed materials! Learning about the issue of plastic pollution motivated students to share their knowledge throughout the school and bring attention to the plight of our ocean. 5 ft. size leatherback sea turtle made from reclaimed materials, including air pillows! Photo credit: St. Vrain Valley School District. Through our education and research programs, we are laying the groundwork for further marine conservation in Colorado and abroad. Providing the tools for students to take action inspires a new era of leaders to take action against environmental degradation and to make changes within their own community. 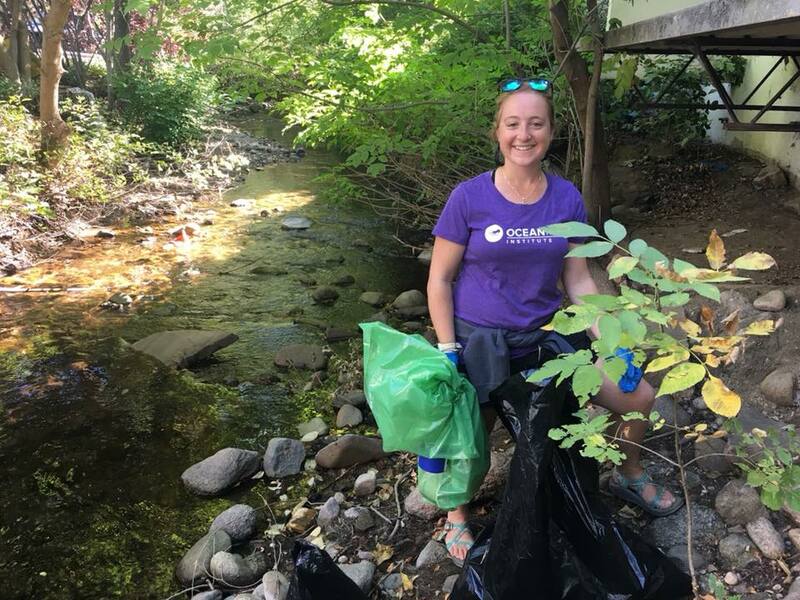 Keeping our waterways clean at this year's Boulder Creek Cleanup! Photo credit: Ocean First Institute. This past year, after discovering the impacts of plastic pollution through OFI conservation programs, local students at Mead Elementary created the Green Team within their school. These students picked up trash during their free time at recess, sorted each item, and recorded the types of debris they discovered. These young ocean advocates were determined to keep their community clean and also encourage others to be a part of the solution. Stories like these in Colorado and across the world inspire the leaders of tomorrow to instigate change, no matter their age or where they live. Last year, with the help of supporters like you, we reached over 4,900 students through our education programs. This upcoming year, we hope to continue to expand these programs and grow awareness around our intertwined ecosystems. We need YOU to help inspire the next generation of ocean advocates. Help us connect youth with the ocean, encourage them to explore STEM fields, and motivate them to become stewards for our blue planet. By making a gift today, you can be a voice for the ocean and help protect our natural world for future generations. $50 - Supports supplies for 25 students participating in a local conservation challenge, such as the Say No to Plastic Straws challenge, helping provide students with fun handouts, like stainless steel straws, to encourage their participation in positive actions for our environment. $150 - Supports an entire classroom with supplies and in-school lessons, as well as a presentation by an OFI staff scientist, for an incredible ocean discovery experience - helping to encourage over 30 students in exploring the fields of STEM and ocean exploration! Thank you for all of your continued support to make our mission possible! 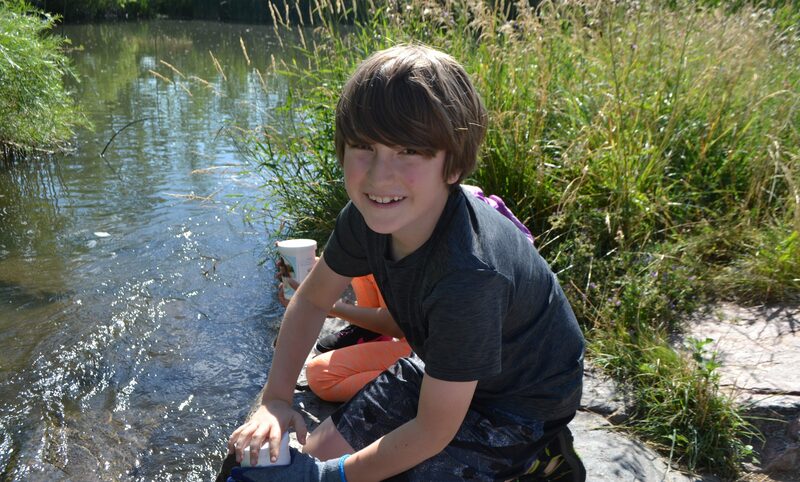 Summer camp member testing local water quality samples. Photo credit: Ocean First Institute.